The test is an affordable strong competitor in the DNA testing world, but has some issues. 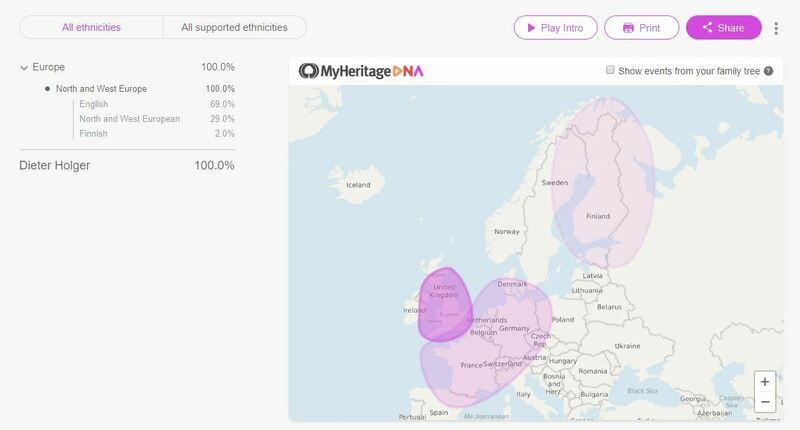 MyHeritage’s DNA testing service may be similar to that of its older rival, AncestryDNA, but it differs in one important way: MyHeritage DNA has more users outside the US. For Americans looking to connect with long-lost relatives across the Atlantic, that makes it a compelling option. Still, choosing MyHeritage DNA over another service won’t be a cut-and-dry decision. As one of the newer companies doing DNA analysis, MyHeritage DNA has tested nowhere near the same amount of people as its established rivals, and its database reflects that. Right now, MyHeritage DNA has data for more than 2 million people, while AncestryDNA’s records contain more than 10 million. That number won’t affect the accuracy of being matched with relatives—MyHeritage DNA’s test will be just as spot on as its bigger competitors so long as DNA from one of your relatives is in the database. That’s because MyHeritage DNA is an autosomal DNA test, or the most common test for ancestry out there. It examines your autosomes, which are 22 of the 23 chromosome pairs you share with relatives on both sides of your families. Geneticists say autosomal chromosomes can accurately find relatives within seven generations, or roughly 210 years from your birth. These tests are 90 percent accurate when finding first and second cousins, but lose accuracy as the relation grows more distant. MyHeritage’s database size does however mean fewer potential people to match with. Beyond that, the smaller amount of data also matters because the more DNA in the database, the more accurate these tests are at estimating genetic origins. That’s not to say MyHeritage DNA is inaccurate, but rather, bigger services like AncestryDNA and 23andMe have an advantage. I personally prefer cheek swabs over spitting over and over again in a vial, so I found MyHeritage DNA’s test far more fuss-free than AncestryDNA and 23andMe, which require saliva samples. Another benefit of the cheek swab is that you can drink or eat within 30 minutes of taking it. With saliva tests, you can’t. Generally, I was more impressed with MyHeritage’s packaging and the ease of taking the test than any of the others I took. After you swab a cheek, you put the swab in a vial and easily snap it off along the black line. After both vials are tightly closed, you then seal them up in the biohazard bag and put it in the return envelope. Unfortunately, you’ll need to cover the postage to send your DNA sample off to the lab in Houston, Texas. That’s an extra cost that you won’t pay with services like AncestryDNA and 23andMe, which cover the shipping of their return mailers. Also in the kit is the activation card, which you’ll need to receive your results on MyHeritage’s website. 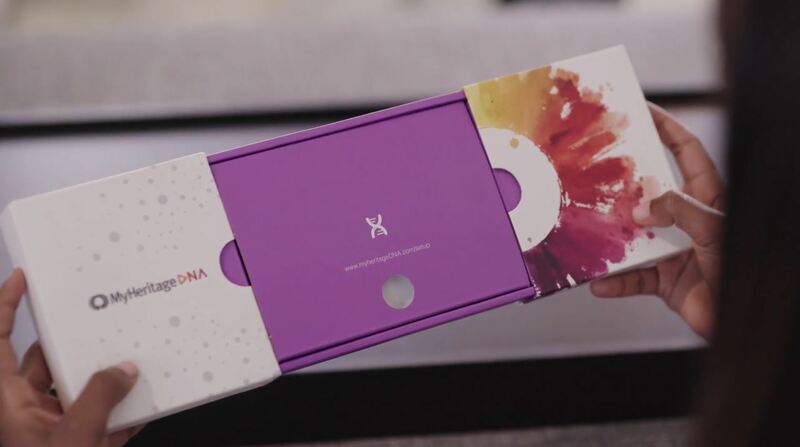 MyHeritage DNA's box pleasantly slides apart. MyHeritage has a turnaround of 4 to 6 weeks after the sample arrives at the lab. That’s faster than competitors AncestryDNA and 23andMe, which require 6 to 8 weeks, and notably quicker than LivingDNA’s 10 to 12 weeks and Helix’s 8 weeks. The first part of MyHeritage’s results is a slick animated “intro” video that lists all your estimated ethnicities. After it finishes, you’re presented with the full map showing your ethnic regions. This map is pretty basic and doesn’t have any interactivity, unlike AncestryDNA’s. However, a smaller, interactive map is available when you view your Ethnicity Estimate under your account dashboard. This split set of maps is puzzling, as one large interactive one would be much clearer and easier to reference. MyHeritage’s results dramatically diverged from the other tests I took, which had been for the most part in agreement with family history and records. 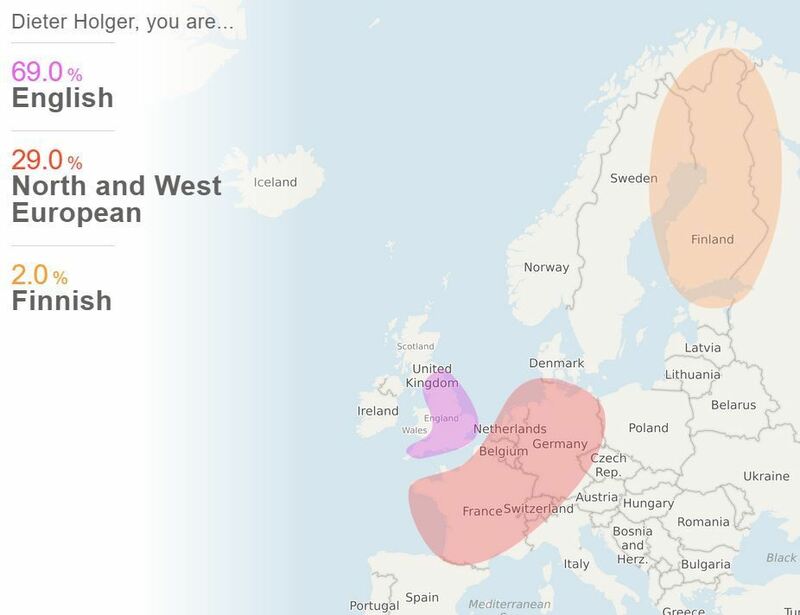 MyHeritage said I was 69 percent English, which seems odd since my father is most certainly from German and Swedish ancestry and we aren’t aware of any English on his side. In contrast, AncestryDNA pegged me at only 26 percent British, 34 percent West European, and 21 percent Scandinavian. 23andMe gave similar results as AncestryDNA. These breakdowns are in line with my family records and history. MyHeritage also only identified three ethnic groups for me: British (69 percent), North and West European (29 percent), and Finnish (2 percent). Those results seem overly simplified when compared to the other tests I’ve taken. AncestryDNA, for example, divided me into four ethnicities and four low confidence ethnicities, totaling eight different cultures. MyHeritage says that DNA tests taken by the same person can result in “slightly different processing” due to small differences of “chemical nature” and how algorithms are processed. In other words, not all tests will yield the same results because of their methodology. It’s unclear why the difference exists, but the lower accuracy when compared to the two largest DNA testing services makes MyHeritage a less appealing option. My mother happened to also take the MyHeritage DNA test, and her results listed multiple ethnicities with high percentages that never registered in my profile. You can review a list of your DNA matches through the site. 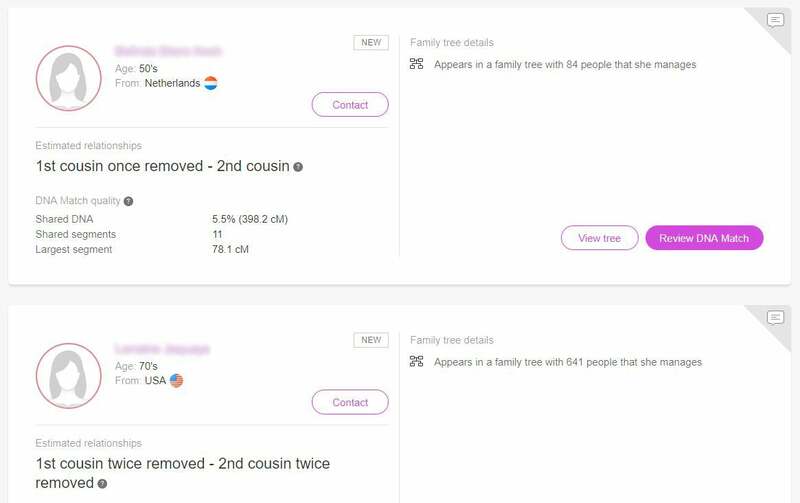 One of MyHeritage’s key services is matching you with relatives. The results divide your pairings into three categories: close family, extended family, and distant relatives. According to MyHeritage, I have thousands of distant relatives in its database, but only two people who are close or extended family. Neither person nor their last names rang any bells. MyHeritage lets you compare your DNA to matches. One thing MyHeritage does nicely is how it lists the number of relatives you have by their ethnicity. 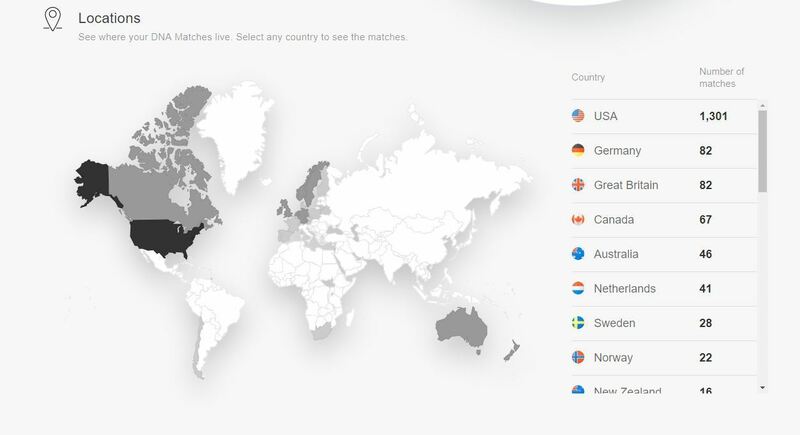 It also provides yet another map that shows you where most of your DNA matches live. The map of where your DNA matches live. The list’s accuracy could use improvement, though. For instance, it said I had 1,134 DNA matches who were Irish, Scottish, and Welsh, but that my DNA was 0 percent from this group. 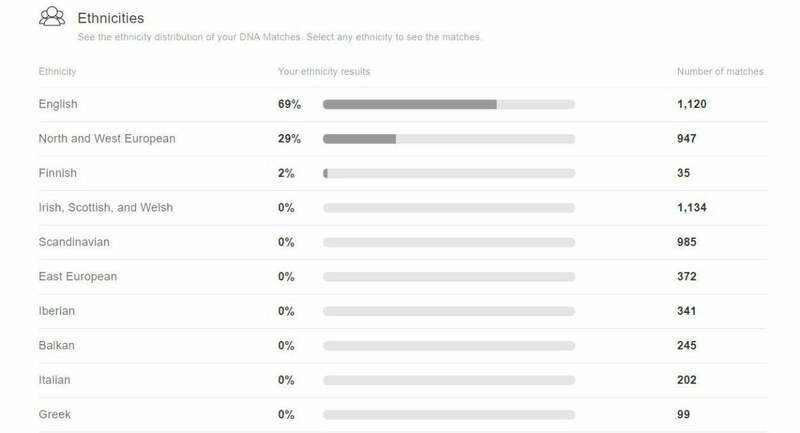 I also apparently had 1,120 DNA matches who were English while being 69 percent from this group. My test results from MyHeritage’s competitor, AncestryDNA, did identify me as 4 percent Irish, Scottish, and Welsh, which lends credence to me having distant relations there. But MyHeritage’s contradictory way of presenting this particular subset of results leads me to question the overall information further. MyHeritage breaks down the ethnicities of your DNA matches. Missing from MyHeritage’s results is information on your ancient lineage and the migration patterns of ancestors from thousands of years ago. LivingDNA, 23andMe, GPS Origins, and Helix do provide this information, which they determine by testing your yDNA from your father and mtDNA from your mother to match your DNA with genes shared by haplogroups. This allows them to identify a common ancestor that a group of people descended from tens of thousands of years ago. 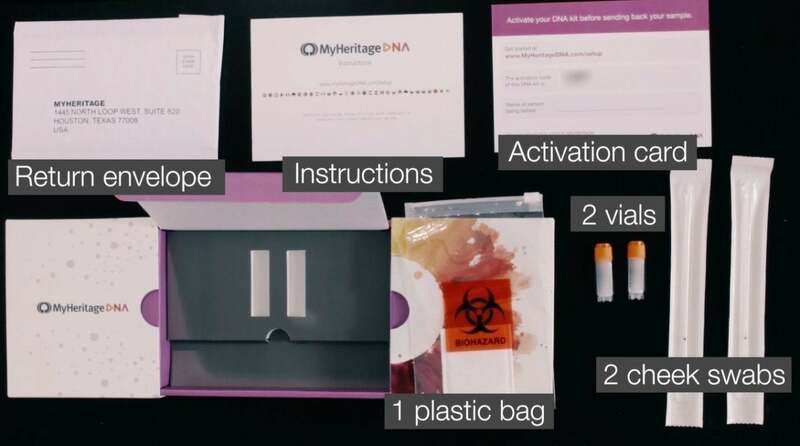 A MyHeritage spokesperson says that to protect your DNA data, the company employs "multiple layers of sophisticated encryption," and are certified by the FDA and College of American Pathologists for handling DNA data. That explanation is not as clear as it could be, as rivals have shared their data encryption policies more explicitly. Living DNA, for example, says it uses AES-256 to protect user data. The My Privacy page is refreshingly simple to use. You’re presented with a range of tick boxes, which are automatically all ticked, that grant you control over various privacy settings (e.g, allowing comments on your profile, letting users download shared DNA segments data, etc.) In My Privacy, you can then go to DNA Preferences to decide if you want DNA matches to be able to see you, view your ethnicity estimate, or view or compare your shared DNA. There are also two consent agreements under DNA Preferences you can withdraw from at any time. Although MyHeritage doesn’t share any data with other companies, it does use your data for its own scientific research. If you don’t feel comfortable with this, just untick the boxes to opt-out. You’re also given the choice to opt-in to these agreements when you register for your account. 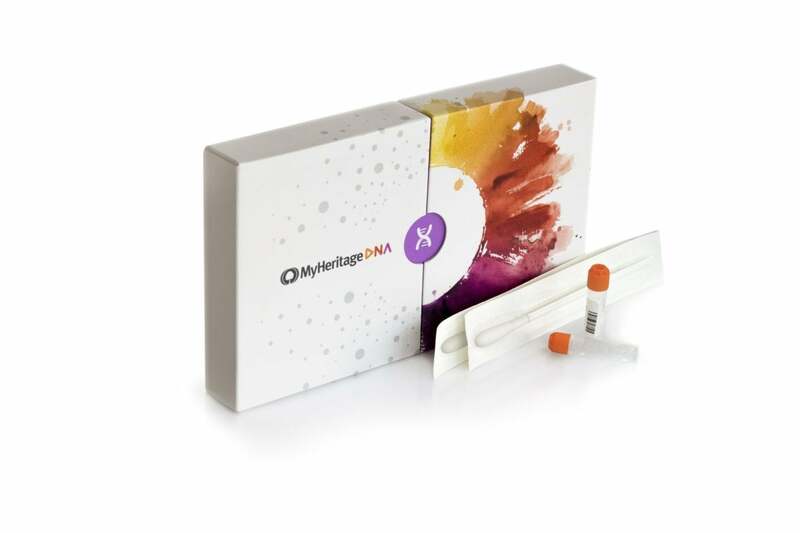 MyHeritage’s DNA test kit retails for $79, but often has sales and promotions which bring the price down to $59. Even at its full retail price, MyHeritage is $20 cheaper than AncestryDNA, 23andMe, and Living DNA. The only downside is that you have to pick up the postage, but that shouldn’t cost more than $10 max. Like Ancestry, you’ll need to pay an additional fee ($13.27 a month) to gain access to MyHeritage’s vast collection of genealogical records culled from historical and government documents. But the DNA matching service you get from the one-off payment works well enough on its own. MyHeritage is the international answer to AncestryDNA and delivers essentially the same service with a few added perks, including DNA comparison with relatives and the ability to upload DNA from other providers.